/ Ultimate Grohe Rainshower Review 2018 – The Best Way to Shower! Ultimate Grohe Rainshower Review 2018 – The Best Way to Shower! Life has never been more stressful, and with everyone working harder we all need to make the most of our home and relaxation time. Having the right shower fixture is essential to making your shower not just a routine, but an experience. Speaking of the "right shower fixture" in this post you will be reading about our Grohe Rainshower review! If you are interested in taking a look at others, then take a look at our shower faucets buyers guide! When selecting the right shower you’ll have a range of options to choose from. One of the heavyweights in the industry are GROHE, who are renowned for their luxury bathroom fittings and have built a name for themselves by combining innovation and technology in their products. The company produce a whole range of products which are designed to enhance your daily life and have won awards for their designs. If you are interested in this faucet you should also make sure you check our our shower pan reviews page. 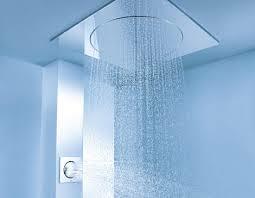 The GROHE Rainshower is a full shower system which can be wall mounted or ceiling mounted. The GROHE Rainshower is one of the more expensive options on the market but it’s getting positive reviews across the board. Let’s take a closer look at the features and see if it’s right for you. 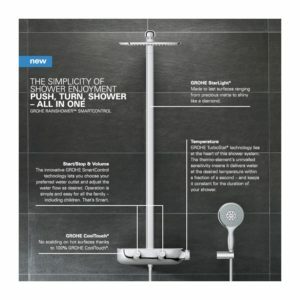 The GROHE rainshower has been created to provide for each customer’s individual needs. There are a number of built in functions for comfort, efficiency and safety so they can be used in any home. Bokoma Spray features 8 nozzles which switch on and off. This breathing effect allows for a massage of your skin, for deeper relaxation. The Jet Spray system is a powerful concentrated burst of water which revitalises the skin. This is perfect for re energising yourself in the mornings to prepare for the day. 02 Spray System is used for a wider spray pattern. Air is drawn into the nozzles and the lighter spray is designed for luxurious comfort. GROHE have taken the time to perfect different spray systems to meet specific needs. The options available are varied and allow for different skin types and preferences. GROHE DreamSpray technology has been specially developed to enhance the user’s experience. Water is evenly distributed over each individual nozzle so that the spray is kept even and consistent no matter which spray pattern you’re using. This means a better shower experience for you and your family. The GROHE Rainshower features an integrated thermostat that has been created specifically for their range of showers. Cutting edge industry technology has allowed the thermostat to adjust within milliseconds to changes in temperature. The sensitive thermo element lets you select your ideal temperature and then will keep it consistent for the duration of your shower. GROHE have introduced unique safestop technology to protect you and your family. The temperature control can be set so it will never go above a certain temperature (preset to 38 degrees) to protect from accidents. This is an essential feature for those with children who need to be sure of the family’s safety. With push to start buttons and easy switching from bath to shower, GROHE have made their shower system extremely simple to use. This means you’ll always be in full control, even with soapy hands! While your water will remain hot the shower casing and outer elements will stay cool to the touch. An innovative cooling channel creates a space between the water and the surface so It’s never too hot to touch. Again this is an essential safety feature for those with children who could cause themselves serious harm. GROHE ECOJoy system is inbuilt into the GROHE Rainshower to decrease water and energy consumption. With more efficient systems and enhanced flow you’ll use a fraction of the water, protecting the planet and lowering your energy bills. 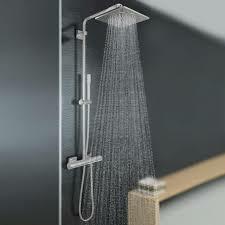 The GROHE Rainshower features are pretty impressive and give you a shower system that does more. It’s not just about comfort and relaxation, it’s about safety and efficiency, and providing an enhanced shower system for your whole family. If your family is in need of a low water pressure solution then check out our rainfall shower heads for low water pressure reviews. GROHE quality isn’t just in the features but in the build quality itself. GROHE Rainshowers are built solidly and made to last with features unique to GROHE products. GROHE build their Rainshower nozzles from silicone. This means limescale is a thing of the past and easily removed, making cleaning simple. GROHE build their shower hoses to be twist free and flexible. Shower hoses are the most common replacement that has to be made and this adjustment means your will keep going while other brands break. Take a look at our metal shower heads guide for added durability. GROHE research new materials and techniques to keep their products at the cutting edge. This means their products keep getting better and provide more value to you. The Rainshower is made to be a permanent fixture in your home for many years, and while it may cost a little more it could prove to be a good investment. “This is great - and I have fitted spotlights in the shower that can change colour - great showering experience. I start on the rainfall shower, then move to washing the shampoo out with the smaller head, change nozzle to narrow focus powerful jet wash type spray lol and then finish on the massage spray - wow!” - David A. “The problem is based on GROHE designing the shower to use only screwed offset pipe connectors rather than wall mounted compression fixings.” - Sarah H.
GROHE have made the shower fixture in a fairly unique way so it’s important to get a professional to take charge of the fitting. Find a plumber you trust and make sure you can get any problems resolved as quickly as possible so you can start enjoying the features. GROHE have created a very user oriented product so it’s unsurprising that the reviews are positive. It’s a high end product in the industry so you would expect a lot, but problems can happen with any company. Make sure you know who to contact if something goes wrong or if there are issues so you aren’t caught out. GROHE stands behind their products by offering a 5 year manufacturer's warranty on their Rainshower system. This covers all of the materials and any workmanship in the products against standard wear and tear as they are built to last. Always be sure to read through any warranty carefully to make sure you know exactly what’s covered in case something does go wrong. The GROHE Rainshower has some impressive features but what it all boils down to is the benefit for you. GROHE have created one of the most versatile and useful products on the market which has spray patterns that give you the comfort and relaxation you need. The GROHE Rainshower goes beyond the comfort and luxury though with safety features to keep your family safe and efficiency to lower your bills. GROHE take pride in creating a product that lasts and every piece from the inside technologies to the outside metals is carefully chosen to stand the test of time. The end result is a great product which should be in your home for a long time. It’s more expensive than some alternatives but the GROHE Rainshower could go beyond enhancing your bathroom, and could enhance your whole home. 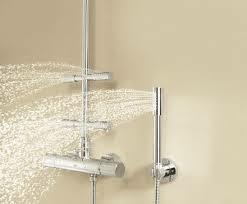 Overall I believe that the Grohe Rainshower is one of the best faucets available on the market today. It provides you with a combination of modern style with a quality faucet that provides the right amount of water pressure and cleaning ability.